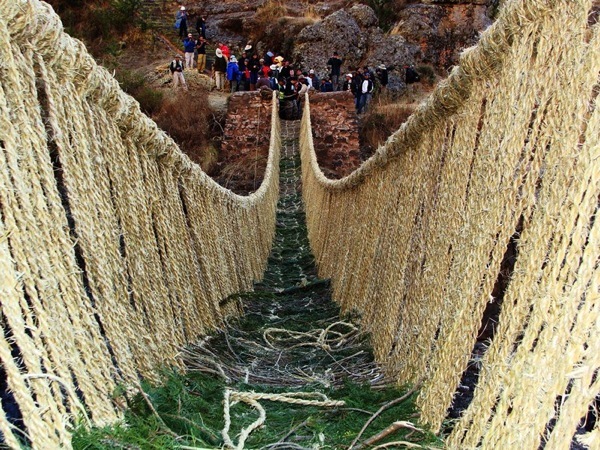 Weaving a bridge of grass just once would be quite a feat, but high in the Andes the native Peruvians do it every year—and this year’s bridge will be built again soon. 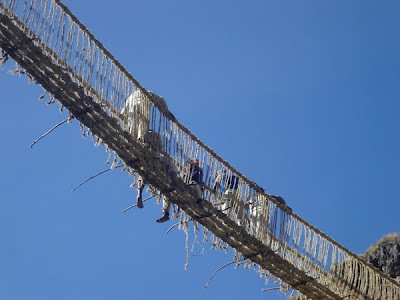 Ever year in the second week of June, about 1,000 people from surrounding indigenous communities gather for three days to reweave Qeswachaka, which spans 120 feet over, and 60 feet above, the Apurímac River, and they invite the curious to take part in their festivities. 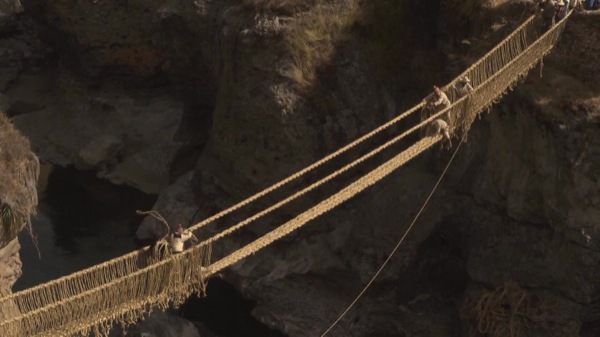 Six long, thick cables made from the local Qoya grass form the chasm-spanning base of Qeswachaka, and these cables are sheathed in a net of thinner grass ropes and anchored at each side of the ravine by eucalyptus trunks. Qeswachaka is the last of an ancient network of grass rope bridges that crisscrossed the Andes and connected the Inca Empire. 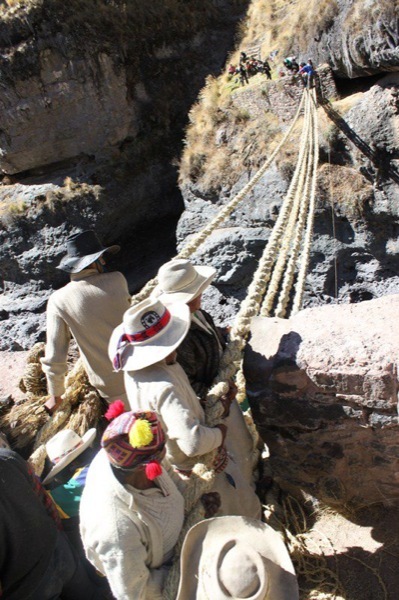 When the conquistadors laid waste to the Incas, most of these bridges became casualties. But the skills to make these bridges survived and were passed down from generation to generation for more than 500 years. 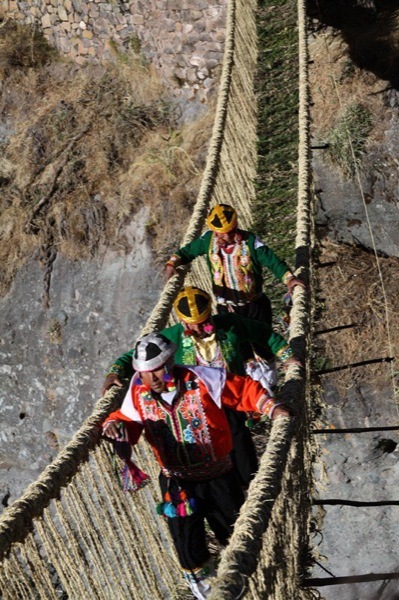 Qeswachaka has been the lone bridge to survive the conquest and is now reborn yearly as a cultural celebration. 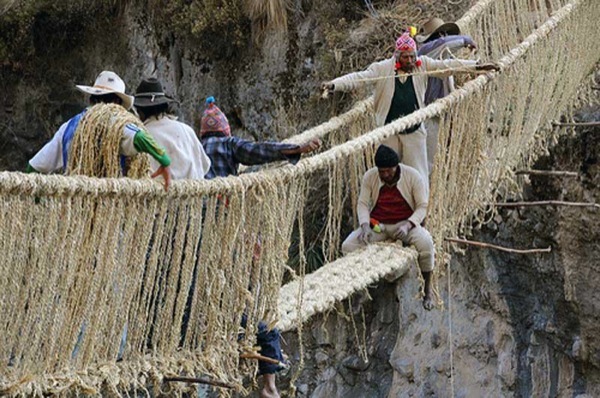 Check out this hand-crafted crossing below. 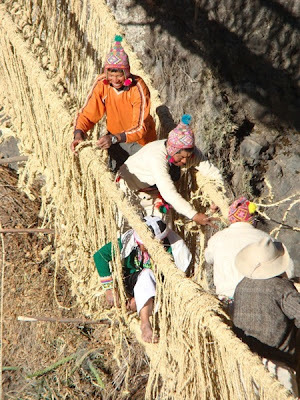 The weaving skills used to make the bridge have been passed down from generation to generation for more than five centuries. The Qeswachaka bridge is woven from thick cables of Qoya grass and bound to strong eucalyptus trunks on both ends of the ravine. 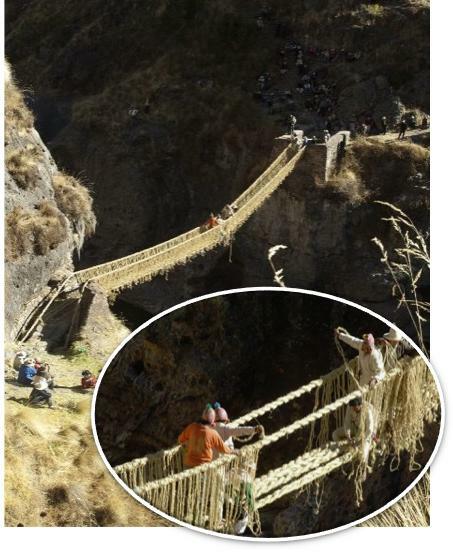 It’s a big task, but, with hundreds helping out, constructing the Qeswachaka bridge takes just three days.